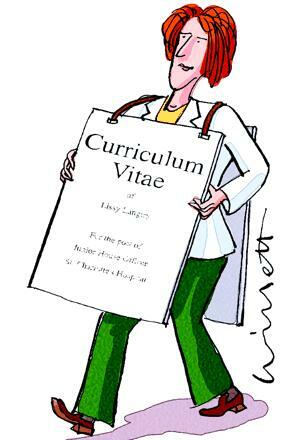 While most doctors leave the growth of their curriculum vitae (CV) to chance, some actively influence the development of this vital self marketing tool. A CV grows through acquisition or development of the following: work ethic, effective communication, clinical competence, qualifications, team working, teaching skills, clinical audit, clinical risk management, and leadership skills. Here are some tips on how you can gain some of the skills and attributes. A committed work ethic means self motivation and initiative, good time management, team working, and communicating with patients and professional colleagues effectively. Effective clinical performance is the foundation of a medical career. Your CV may get you an interview, but you need good references to secure the post. Increasingly, requests for references tabulate attributes or skills—such as timekeeping, initiative, attitude to work, teamwork, clinical performance, communicating with patients and colleagues, dependability—on which candidates should be graded (poor, fair, satisfactory, good, or outstanding or similar categorisation). Does the doctor give the patient the information he or she asks for or needs about his or her condition and its treatment and prognosis in a way the patient can understand? Does he or she communicate adequately with colleagues and other healthcare professionals? To ensure good references and increase the likelihood of success in the search for career opportunities it is vital to cultivate clinical competence and effective communications skills (speech and body language, active listening, and effective writing). The earlier you acquire professional qualifications, the sooner you can concentrate on career development. If you do not have membership of one of the royal colleges, you have no chance of becoming a specialist registrar (SpR), let alone a consultant. Applicants for senior house officer jobs list attendance at life support courses (advanced life support, advanced paediatric life support, and so on) in increasing numbers. Evidence of such skills could soon become mandatory in short listing for these posts. It is therefore advantageous to attend relevant courses and conferences and keep certificates of attendance as evidence of professional development for clinical appraisal and GMC revalidation. Does he or she respect the skills and contributions of other healthcare workers? Does he or she delegate, consult, and refer appropriately? Prospective employers want to know if you work well with other healthcare workers. Doctors are expected to evaluate their clinical performance. The Department of Health and the Commission for Health Improvement and Audit (NHS Quality Improvement, Scotland, and Health and Social Services Improvement Authority, Northern Ireland)2 take clinical audit as evidence of good medical practice. Present your audits at meetings and seek to publish some. Abstracts of clinical audits enhance the quality of your CV. A published paper is an impressive addition to an application form and CV. Healthcare risk is the probability of a patient suffering harm from clinical activity. The risk may be clinical (wrong diagnosis, wrong treatment, faulty equipment, and so on), environmental (slippery floors, falling objects, and so on), or organisational (poor supplies, inadequate staff, and so on). Risks are minimised by recognition and prevention. Clinical governance aims to ensure that patients get effective and safe treatment and that the risks associated with clinical care are prevented or minimised. You should appreciate the importance of clinical governance and risk management, the use of clinical guidelines, and the need for continuous professional development. You should be able to describe your contribution to clinical governance in your CV and at interviews. Does this doctor accept responsibility for teaching junior colleagues? Is he or she honest and objective in assessing the performance of others? Does he or she ensure that juniors are properly supervised? Management is the art of doing things right (properly), while leadership is the ability to identify the right things to do. Management and leadership skills improve with good practice.3 Some people are good at management, while others excel as leaders. Some are both good leaders and good managers. Serves as president of the junior doctors' mess. Information technology (IT) skills (typing, desktop publishing, website design, and so on) will enhance your employability. Writing skills are useful in crafting CVs, covering letters, and preparing patient information literature. Some doctors and clinical departments write and publish books. General Medical Council. Good medical practice. 3rd ed. London: GMC, 2001. Loeb M, Kindel S. Leadership for dummies. New York: Wiley, 1999. Houghton A, Peters T, Bolton J. What do new consultants have to say? BMJ Career focus2002;325: 145. MacDonald R. The New Consultant Entry Scheme. BMJ Career focus2004;328: 39.